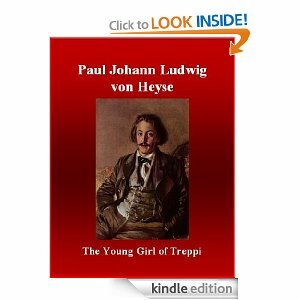 Paul Johann Ludwig von Heyse, from Germany, is another author on my ‚To Read Nobel Prize for Literature’ List. He got his Nobel prize in 1910. I perceived the author as a painter. This story can transform the reader into an Impressionist Museum’s visitor. I had the impression of sitting in front of a majestic painting: „it was so refreshing to be tramping along this path, overgrown with bushes, fifty feet above the torrent, to feel the fine spray of the waterfall dash…, to see the lizards slipping over the stones, and the graceful butterflies chasing the furtive sunlight…”, „Filippo noticed the perfect majesty of the wilderness over which was hanging a clear, transparent sky”… . It’s a love and devotion story. The location is the Apennines. A lonely village called Treppi. Filippo’s adventures took him to this lonely village on his way to a duel. There, in the middle of the night, he stopped at the only house where there was a sign of life. It belonged to a young girl, Fenice, who fell in love with him 7 years ago, when he was there on business. Fenice admitted her love to him. He rejected it. She plotted that he stays with her and forgets about the duel. A ‚magic potion’ is part of the play. … And I will stop here and let you read the rest :). And yes, she did save his life. With Love. I simply want to say I’m very new to blogging and site-building and really liked your blog site. Probably I’m want to bookmark your website . You really come with tremendous article content. Cheers for sharing your website page. I just want to mention I’m very new to blogging and seriously enjoyed you’re web page. Almost certainly I’m planning to bookmark your blog post . You amazingly come with really good stories. Thanks a bunch for revealing your blog.